Don’t quite know how to move to the Philippines? I wanted to come out with a “Master Article” detailing the process of How to Move to the Philippines, so I have finished it up and here it is. I hope that you will find important information here that you need and will assist you with your Move to the Philippines. If you need more information than what is available here, we offer great coaching services that can help you through the process of your move to the Philippines. Our coaches are all people who have been through the moving process, know all of the ins-and-outs, and are professional, courteous, and knowledgeable. If I want to Move to the Philippines why should I listen to you? When we were going to move to the Philippines, I was 38, Feyma, my wife, was 31. Feyma was born and raised in the Philippines. We married in General Santos City, Philippines in 1990 and Feyma came and lived in the United States for 10 years. Then, we decided to return and move to the Philippines. When we made our move to the Philippines, we elected to bring most of what we owned. We considered this to be a “rest of our life” move, and we took the things that were important to us. We were a young couple, had 3 kids, and we brought a lot of stuff. Our move to the Philippines involved packing our stuff into a 40′ container and having it shipped via ocean freight to the Philippines. We elected to have our container full of goods shipped directly to General Santos City where we had decided to move to. Doing this made the move to the Philippines easier. If we had our container arrive in Manila we would have had to travel there for customs clearance and other procedures that you must complete when you move to the Philippines. Having owned the largest and most popular Philippine Expat website for more than a decade and blogging there since 2006, you can imagine that I get a lot of questions from people about making a move to the Philippines. Below, I have compiled the questions that I hear almost daily. I get hundreds of questions, but these 25 or so questions are ones that I hear over and over again. I want to give you precise answers so that you can make the move to the Philippines as easy as possible. Making a move to the Philippines is not something to take lightly. It is not all pleasure, there are challenges that you will face, I can assure you. How do I know? Well, I made a move to the Philippines from the USA in 2000, so I have experience. I have been living full time in the Philippines ever since, and to be honest, in those years I have never been back to the USA. A lot of people whom you run across online will say that the Philippines is paradise, and that is why they move to the Philippines. It’s a panacea. It’s perfect. There are no problems in the Philippines. Nothing could be further from the truth. There are problems and issues in the Philippines just like every other country in the world. Some would argue that there are more problems and issues to deal with in the Philippines than most other places. I could not argue too much with what they say. But, what I will say is that there are ways to overcome those problems through the process of adjustment that you must go through when you move to the Philippines. It is not easy, and it is not quick, but you can do it. Another thing you can count on is that making a move tot he Philippines, halfway around the world is a lot of work, requires a lot of planning, and even your best-laid plans probably will turn out much differently than you expect them to. Best to go with the flow. Steer things the direction that you want them to go, but understand that not everything is going to work out the way you thought it would. Accept that, there is nothing you can do to change it. Do you think that a move to the Philippines is going to change your outlook on life? Are you currently unhappy, and feel that a move to the Philippines will bring you happiness? Believe me, it won’t. If you are unhappy with your life, you probably still will be unhappy when you get to the Philippines. It is not being in the Philippines that will make you happy, it is making changes in your life that will get rid of the unhappiness and allow you to be happy. Anyway, let’s get on with looking at a step-by-step guide to what you need to do to move to the Philippines. Really, I would argue that if you are married, the very first step you need to take if you want to move to the Philippines is to talk it over as a couple. Of course, if you are single, you can pass over this part of the article, because it is your choice and only your choice. But, if you have a spouse, it really must be a joint decision that is made through careful consideration and mutual agreement. My wife, Feyma, is from the Philippines. We got married in 1990 in the Philippines. I never really had any desire to move to the Philippines, although I did enjoy visiting every couple of years. The thought of actually living in the Philippines never even crossed my mind, though. By the middle of the 90’s and the Internet was in full bloom, I made a lot of friends on the Internet who had a Philippine connection. Some were Filipinos, some were other Americans or other people from western countries who had wives from the Philippines, or who had traveled in the Philippines. Conversations on the Internet turned to the possibility of making a move to the Philippines. I was intrigued. It didn’t take too long after considering such a possibility that the bug bit me. Suddenly, I felt that it was a move I would like to make. When I breached this idea with my wife, she was shocked! She not only said no, but she was super firm that there was no way she was going to move to the Philippines. Why did my wife feel this way? Well, I can’t say for sure, but I strongly believe that in my wife’s mind, living in the Philippines was synonymous with being poor and living a hard life. Over time we talked about it more, and while it took a long time, my wife’s opinion began to loosen up. She was not so adamantly against a move to the Philippines. It was not so much that she wanted to move to the Philippines, probably more that if I wanted to move to the Philippines so badly, she was willing to support my desire to do so. I explained to Feyma that we had a nice nest egg and we could actually live quite a happy and comfortable life if we would move to the Philippines. She came to understand that. We had lots of things to consider, though. At the time we began considering the possibility of making a move to the Philippines, we had two kids (by the time we actually made the move to the Philippines we had three!). There were family considerations. I would be leaving behind my extended family. Could I handle living near to her extended family? What about schooling for the kids? Would our kids be leaving behind opportunity if they left the States? How would we earn a living after a move to the Philippines? We did not have enough money to last forever. I was only 38 when we made our move to the Philippines and needed to earn an income for my family. We talked all of this over and came up with solutions, or potential solutions to everything that we thought of. As it turned out, many of the things we planned turned out way different than what we had planned, but still, we had a solid plan, and the means to be able to make it on our plan. That is a real key, do you have the resources to move to the Philippines and support yourself for long enough until you can stand on your own two feet? If you don’t, then don’t even try. The Philippines is not a place to be if you don’t have enough money. There is no kind of social program here for those who have no money. You are on your own. Be prepared financially when you make the move. If you are not, you will likely regret it a lot. During our discussions, one thing that my wife and I agreed on was that if we were to move to the Philippines, we would commit to living there a minimum of 5 years, no matter what. As it turned out, this is the best thing we did in the whole process of moving to the Philippines. Why such a long plan? Well, it is not cheap to move to the Philippines, halfway around the world. Because of the amount of investment involved in making the move to the Philippines, we figured that it was really incumbent on us to stick it out long enough to allow ourselves to adjust to life in the Philippines. If we made a move to the Philippines and left after 6 months, well, we would not have given ourselves enough time to make the adjustment. After we made our move to the Philippines, it did not take long and my wife was ready to move back to the States. She was depressed and did not like living back in the Philippines. But, when I reminded her of our 5-year commitment, she accepted it, something for which I respect her. It took almost exactly 5 years and both my wife and me became pretty happy with our move to the Philippines. It is not an easy adjustment to make, so be sure to make such a commitment and give yourself enough time to adjust. Another thing to consider is something that a fair number of people do, and that is snowbirding. That’s right, a number of people live part of the year in the Philippines, and the other part of the year back in their home country. Usually, people move to the Philippines for the cold months in their home country, and the warm months back home in the USA. Personally, I feel this is a bad idea. At least for a few years. Why? Because you need to have time to adjust to the culture and lifestyle of the Philippines. If you move to the Philippines for a few months, then going back to your home for the rest of the year, you will never really have time to make the adjustment to your move to the Philippines. You need, in my opinion, a good solid run of about 3 to 5 years of living in the Philippines to make the cultural adjustments to life here. After that amount of time, if you still want to split your time between two countries, go for it, you will have already made the adjustment! After you have talked it over by your wife, or with others who will be impacted by your move, it’s time to start laying plans. There are some things you can accomplish while you are still in your home country (for purposes of this writing, I will assume that you are in the United States, but you can substitute your own country). There are other things that you need to do after you move to the Philippines. Some other things can be done in either place, it is your choice. Let’s start looking at some of these things. If you going to move to the Philippines, you will need some kind of Visa to stay here. Basically, you have a few choices in this matter. It is something that you should plan for before making the move, this way you can make all of the necessary arrangements. That’s right, you can legally move to the Philippines with nothing more than a tourist visa! When you enter the Philippines you will be issued a Tourist Visa waiver that will allow you to stay in the Philippines for up to 30 days. After this, you can extend your visa. The first visa extension is for 29 days (plus the 30 that come free, bringing you to a total of 59 days). Additional visa extensions are good for 59 days. Once you have been in the country for 36 months you will need to leave for a day. If you have a spouse (or if you) who is a Philippine Citizen or former Philippine Citizen, you are eligible for a Balikbayan Visa, which allows you a one year free, no hassle visa to live in the Philippines. The SRRV is the Special Resident’s Retirement Visa. It is available to anybody over 35 years old and will allow you to permanently move to the Philippines. If you have a spouse who is a Philippine Citizen or a former Philippine Citizen, then you are eligible to receive a 13 Series Resident Visa, which will allow you to permanently move to the Philippines. With this visa, you can live in the Philippines for as long as you wish and you never have to leave. If you decide to get a 13 Series Resident Visa, then I recommend that you apply for it while still living in your home country. You can get most everything done before going to the Philippines. One of the advantages of getting your resident visa before you move to the Philippines is that if the visa is issued abroad, then it is permanent. You only have to go through the process one time. If you wait and apply for your resident visa while you are in the Philippines, then the visa is probationary and is good for only 1 year. If you make it through the first year without getting into any legal problem, then you can apply for a permanent visa. What is a mail drop? Well, I mean a place where your US mail can be sent and then forwarded to you in the Philippines. Maybe you have a brother, a child or a close friend who would do this for you. I don’t recommend that. Why? Because mostly these kinds of people tire of doing it after a while, and the service they provide becomes irregular. Instead, there are lots of companies that will do this for you. They will receive your mail for you and forward it to you (either on a schedule or at your request). Of course, there are fees involved in the service, but it is very reliable. Surely, at least in your early years of living in the Philippines, you will still get US mail from time to time, so it is important to have a way to receive it. A mail drop like this will solve that problem. If you own your home in the USA, then it would stand to reason that you should probably sell it. Another alternative is that you could rent the house out. If you do that, I would recommend hiring a real estate management company to take care of this for you. Most such services charge about 10 to 15% of the monthly rental as their management fee. Since you cannot be on the scene to manage the house as a rental, this fee is very reasonable for the things that you are unable to do on your own. To me, though, if you are sure that you will stay when you move to the Philippines, then the best move is to sell your house if you can. Remember, it may not be possible to sell your house for the price that you need, so it is something you have to weigh and decide on. But, once you have everything in place for a move to the Philippines, it is time to get the house on the market, get it sold and get ready to get on that airplane! This makes sense especially if you have a wad of cash after selling your house. When we sold our house in the USA, we had a lump of about $100,000 in cash. We elected to invest some of it into vehicles that did not allow us immediate access to the cash. It is a decision that I am very happy about. Why? Because when I first made my move to the Philippines, I blew through a ton of cash and did so unnecessarily. Most people who move here do the same thing. They blow through a lot of cash in their first year or two here. If you put some of that money away, it will give you time to figure out how to use your money wisely in the Philippines, before you blow your whole wad of cash. Believe me, this is very important. When we made our move to the Philippines, I thought that with the amount of cash we had, I could probably live here for 10 years. But, that didn’t happen. In two years our money was almost gone. It was a shocker for us when we finally faced reality. It was at that point that I decided that I had to learn how to earn money in the Philippines. I spent time learning how to adapt my business experiences to work in the Philippines. But, I did it, and now I am able to tell you how to do it too. To find out how to earn money in the Philippines, check my book, 49 Ways to Make a Living in the Philippines. Maybe you are comfortable working over the internet. You might start some of your own websites and earn money that way, or perhaps you would work from your home in the Philippines for companies based in other parts of the world? If you are comfortable doing this, you may be interested in my other book, 99 Ways to Make a Living on the Internet. Hey, if you are not comfortable using the computer, this is probably a good time for you to learn a little more and get comfortable. Computers are the thing now, and if you don’t know how to use one, or if you are nervous about using one, you are really cutting yourself a tough situation. Get my book and it will enlighten you to lots of ways you can use the computer to make money. You don’t have to be a genius! If you have funds in a US bank account, you need to learn how to it can move to the Philippines. There are a number of ways to accomplish this. You could transfer money by wire transfer, write yourself a check into your Philippine account, use the ATM machine, or other methods. Do not close down your bank account or accounts when you move to the Philippines. Keep some money there, and keep those accounts as a backup, and a way to receive funds in the USA while you are in the Philippines. This is very important, and you will find many uses for having a foreign bank account (foreign to where you live in the Philippines). This is a real key that you should keep in place. In order to be allowed entry into the Philippines, your passport must be good for at least another 6 months. If the expiration date of your passport goes beyond 6 months, you must renew if you wish to go to the Philippines. Better check it and take care of any renewals that may be necessary. After you move to the Philippines you can renew your passport at your country’s Embassy in the Philippines. Where will you live after your move to the Philippines? Before you move to the Philippines, one thing you need to think over and decide about is where you will be living in the Philippines. I am not talking about a specific house, or what street you will live on. I am talking about what city you want to move to, or what part of the country. A lot of people feel this is a difficult decision to make. For most, though, they have a place in mind and it is a simple choice for them. Whether you fall into one camp or the other, though, give it some thought and see if you need to make a decision or if it is already made in your mind. One thing that is kind of endemic in this decision is (if you are married) should you move to an area near where your wife’s family lives? For some people, the wife’s family is a big plus and part of the reason why they move to the Philippines. For other people, the wife’s family is a necessary evil, but they don’t want to live nearby. Nothing wrong with either attitude, but it is something to consider. When Feyma and I made our move to the Philippines, we elected to live in General Santos City, where my wife’s family lives. I love my wife’s family and enjoy them, but it did get a bit overbearing. Every single day, 7 days per week, I had dozens of family members at my house from very early in the morning until late at night. In fact, when I went to bed they were still there. This was part of the reason why we later chose to move to Davao City. Davao is about 2 to 3 hours driving, up to 4 hours on the bus from General Santos. We are far enough away that we can live our own lives, yet close enough that the family can visit us without a hassle. We have found that this distance has worked out perfectly for us. So, choose a place where you will live, but keep in mind that you can always move a little further away, or even a little closer to the family if that suits you. Some people decide to build a house in the Philippines prior to their move to the Philippines so that they will have that dream house waiting for them upon their arrival in the Philippines. This may work for some folks, but personally, I feel that it is a poor choice. I think that for at least the first few years it is better to rent a house. Because that way you can find out if the Philippines is really for you. Is the place where you have decided to settle in the Philippines the right place for you. Maybe there are neighbors that are loud, roosters crowing and such. If you are renting you can move to a different neighborhood. If you built a house of your own, you are stuck. So, I strongly recommend that for now, you hold off on building that dream house. Give yourself time to adjust and decide where your Philippine residence should be. Why choose to rent in the Philippines? Some time ago I published an article on my website talking about the fact that we were about to move, as we had rented a new place in Davao. Almost immediately after the article was published, a number of people questioned why I would rent instead of buying a property. Jim Cunningham put it in a non-confrontational way, simply wondering why I would choose to rent. Thomad (yes, this is how he spells his name) Gil called me stupid for renting. Hmm… it’s the first time in years that I have been accused of being stupid, but if that is what Thomad thinks, well, so be it. The fact is that I have some real concrete reasons why I would prefer to rent. For others, like Jim or Thomad, if they wish to own a property, that is their decision, and I do not think that they are wrong for doing so, but the fact is that owning a house in the Philippines is not my choice, at least not at this time. So, what would be my reasons for wanting to rent instead of owning a house? First, timing is a key factor. Right now, my youngest child is in grade 4. He will finish High School in about 8 years from now. At the time that our youngest child finishes High School, we probably will choose to no longer live in Davao. Jim mentioned in his comment that being economically astute dictated that you should own a house instead of renting. He mentioned something along the lines of paying rent was like throwing money away. I am sorry, but I disagree with that. Let’s look at some numbers. The house where I am currently living had been offered to us for sale a number of years ago. The price was P20 Million Pesos. Now, I pay rent here of almost P38,000. In US Dollars, at today’s exchange rate, the asking price for this house would be $476,000. My rent in US Dollars would be $883. OK, so if I take $476,000 to buy a house, or to build one, it could save me from paying $883 per month. Alternatively, if I took $476,000 and invested it with an annual return of just 5%, my return would be $23,800 annually or $1,983 per month. I could invest that money at 5% (in normal economic times that is a quite conservative return) and the interest on the money would pay my rent and also produce an extra $1,100 per month of income for me. If I buy the house, I no longer have the principal, and I save $883 per month. If I were able to get 7% interest instead of 5%, my monthly return becomes $2,776, an increase of about $800 per month! In the USA, Real Estate investors generally shoot to get a minimum of 1% of the property’s value each month as rent. That makes economic sense and makes it prudent to buy a property. After your move to the Philippines, the numbers should be considered in the same way. I have been paying only 2/10ths of one percent of the property value for rent! That’s almost like they are giving it to me! Economically, buying property in the Philippines is a losing proposition. Ah, I know that many are saying that if you buy a house, it will appreciate in value, so it is an investment. Fact is, that is not necessarily true. Especially if you do a large house at the top end, the odds of it appreciating in the Philippine market are small, in fact, the odds are that it will remain the same, or even decrease in value. Maybe a move to the Philippines won’t work out for you. It is hard to sell If you own a house and decide you want to move – maybe you want to go back to the US or wherever you came from, or maybe you want to go to Bohol, Cebu or some other place in the Philippines, the fact is that a higher end property, especially one built “for an expat” who has different tastes than the local market, is very hard to sell. I have seen houses that are up for sale for years here. I have also seen expats who decided to “go home” and had to sell their dream house for a fraction of what they spent to build it. Personally, I have no plans to leave the Philippines, but you just never know. I know one thing, I have no desire to be saddled with a house that I need to sell. I’d much rather have cash. As I have told about repeatedly on my website, I have had some serious issues with my neighbors in the past year. If I owned the house, I would be stuck here and could not just move to a new neighborhood. As Dave Starr mentioned in a comment, what if I had neighbors who decided to open a metal shop, or a pig farm next door? There would be little I could do. If I am renting, I can just move somewhere else. If I owned the place, I would be stuck. Any regular reader knows that Feyma and I own property on Samal Island. We have talked about building a house there. Because of some of the things I mentioned above about Davao, we feel that we don’t want to live in Davao in the future, and that includes Samal. Maybe we will change our minds over the years that are coming, we are not sure. But, right now, we have other options in mind. I have not mentioned here, but Feyma also owns land in other parts of the Philippines (in Mindanao and in the Visayas), and these other places are possibilities for our longer-term living. Maybe we will be in Davao, maybe not. Right now, we are leaning toward not making Davao our long-term home, though. Why would I want to buy a house that could be very hard to get rid of in the long run? The truth is, there are a lot of reasons why, at this time in my life, I feel it is better for me to rent. If others think it is unwise, I have no problem with whatever they think, but I also know what is right for me. Am I stupid for renting? I don’t think so. If some people think I am, I don’t really lose any sleep at night worrying about what they think. I also do not lose any sleep worrying about whether I should rent or own a house in the Philippines. I know what is right for me. I don’t know why others think that I should live by what is right for them. We owned our house in the USA, so we are not anti-owning. I am, however, anti-owning-in-the- Philippines. At least for now, given my life situation, and my future plans. I have no issues with those who want to own, it is their decision. I don’t understand why my wish to rent my house should be a concern for others. Whenever you move to a new place, whether it is across town, to a different State, or halfway around the world like a move to the Philippines, you have to go through your things and decide what you will take with you. Some items need to be thrown out. Other items might need to be sold or given away to friends or family. A select number of items will need to be packed up and moved. Generally, it is my recommendation that things like small appliances that operate on 110V be gotten rid of. This is because the voltage in the Philippines is 220V, and you can bet that despite your good intentions, your stuff is going to get fried. You can buy voltage adapters that will convert the 220 to 110, but it is inevitable that the appliance will get plugged into the wrong voltage, and it will probably happen sooner than later. There are a few such appliances, though, where I believe my rule should be ignored. One such appliance is a nice big kitchen mixer, like a Kitchenaid. These mixers are super expensive here, and if you already have one, best to move it to the Philippines, but be very careful about the voltage. If you have a computer, you may be in luck. Most desktop type computers have a power supply that is switchable. They often have a little red slider switch near the area where you plug the electricity in, and this switch can be set for 110 or 220. If this is the case, you are in luck and can bring your desktop PC without any issues. If you are using a laptop, nearly every laptop made has a power supply that is a variable voltage, usually 100v to 240v or so. Check on the electrical cord, usually, there is a square “brick” in the middle of the cord, and on this brick, you will find the voltage parameters of the device. If your PC will not work here due to voltage, one thing you could do it to remove the hard drive from your computer and bring it with you. At least with this, you will have all of your important data and it can be transferred to your new computer after you move to the Philippines. Better yet, if you have an external hard drive you can transfer all of your data on to that and bring it with you. If you don’t have an external hard drive, they are very inexpensive to purchase. For the most part, I probably would not move large furniture and such. That sort of thing is readily available here, albeit of a lower quality. So, if you are a stickler for higher quality furniture you may want to consider moving it. As for things like clothing and such, I would probably recommend moving your clothing, except for things like winter clothes, or anything that is very hot to wear. If you are a large person – tall or heavy – best to move the clothes that you have, and also you might want to consider stocking up on new clothing to bring. This is because larger sizes are not readily available in the Philippines since most Filipinos are smaller people than we are. Because of this, I am unable to purchase clothing in the Philippines. I either shop on eBay and have it shipped to me in the Philippines, or I go to a seamstress and have clothing made. So, be sure to bring plenty of clothing with you. Many people wish to bring a car or other vehicle with them when they move to the Philippines. Generally, this is not a good idea. I recommend that you sell your vehicle before moving, then if you feel you need a vehicle in the Philippines, purchase one here. The reason not to move a vehicle is that there is a 100% tax on any vehicle that you bring into the country. Also, it may be trouble getting a foreign imported car serviced, finding parts, etc. Another consideration is that cars over 5 years old cannot legally be brought into the country. Sentimental items like pictures and other family heirlooms and such should probably be brought with you, or given to other family members. As for your other things, it is a personal choice that only you can make. Look at each item and decide if you can live without it, or if it has a deep impact on your life, in which case you should probably bring it with you. Generally, there are two different ways to choose from when moving physical goods to the Philippines. Probably the most common method, if you don’t have too much stuff, is to ship your items in Balikbayan Boxes. These boxes can generally be shipped to the Philippines for $80 to $125 per box, regardless of the weight. The price difference accounts for sales which are regular, and also where you are shipping from. In our case, when we made our move to the Philippines, we brought nearly all of our possessions with us. Only a few items were sold, given away or otherwise discarded. For example, I had a few guns, which I gave to my brother. We had two cars, which we sold, and a few other items. Because of the volume of items we brought with us, we called an International Mover to come and look over our possessions and give us an estimate on the cost of moving the items. When the moving company representative came out, he went through our house, I told him which items would be moved and which would not, and he gave us an estimate for the cost of moving. It took only about 30 minutes as I recall (hey, that was 20 years ago), and the information he gave me was very accurate. We took a 40 foot and a 20-foot container to move all of our stuff. The moving company people packed everything up and then had people here to unpack everything. It went very smoothly. The cost of the move was about $10,000. If I had to do it over again, I’d cut way back on what we brought, but that is in the past and can’t be changed now. Moving our items was done on a cargo container ship, and took about 1 month from the time it left the USA until it was delivered in the Philippines. I considered that to be pretty fast, given the distance. It also gave us time to find a house to rent, where we could move the items when they arrived. OK, so you have thought over all of the ramifications of moving. You have made decisions on where and when to move. You’ve sold your house and obtained your visas for living in the Philippines. What next? Well, it’s time to make the move! But, what are the steps that you need to take at this time? Probably the first thing you need to do is to obtain your airline tickets. One thing that there is some confusion about and something that I am asked all the time is whether it is necessary to purchase a round-trip ticket. Well, no it is never required for you to have a round trip ticket. At times, to enter the Philippines, an on-going ticket is needed, but it need not be a round trip. If you will enter the Philippines on a Resident Visa or on a Balikbayan Visa, you do not need any type of ongoing ticket. If you will enter on a tourist visa, you must have some type of ongoing ticket. Of course, you don’t want to forget all of your stuff. You should have already decided what to bring with you, and you should have begun getting rid of the stuff that won’t make the journey. It is time now to start getting the packing and shipping done. Whether you go with shipping via Balikbayan Box or through a Moving company as I did, now is the time to get everything moving! If you elected to obtain your Visa to move to the Philippines while still living in your home country, get everything out and inspect everything. Make sure that you have everything that you need, and it is all ready to go with you on your move. Do not pack this in a box! You must have it on your person when you enter the Philippines. Put it with your airline tickets and your passport, and have everything ready for the day you walk out that door for the last time! Go to your bank in your home country. Let them know that you are going to move to the Philippines. They need to know this, because if they start seeing a bunch of transactions (checks, ATM transactions, etc) originating in the Philippines they will be suspicious, and they may freeze your account until they can investigate what is going on. They will likely suspect that somebody in the Philippines has gotten a hold of your banking information and is defrauding you. If you go and let them know in advance that you will be in the Philippines, this will ensure that your account goes on as usual and you will have access to your funds. It is a good policy to be open with your bank and reveal your plans to them as much as possible. One of the final things you need to do is get together with friends and family who are important to you. Say your goodbyes. Let them know that you will be in touch via telephone or e-mail. Keep a good relationship with these people first because they are important in your life and always will be, and also because you may need their assistance later. Maybe you will need a package shipped to you in the Philippines, or somebody to go to your bank or some other place of business where you need to get something done. Your friends and family are your connection to your homeland and can be very helpful in this regard. Yep, you have one last thing that you need to do now. Grab your passport, your airline ticket, and visa, and go get on that airplane! It’s time to make your move to the Philippines! After you have flown to the Philippines to live permanently, a whole new set of jobs awaits you! You still have plenty to do, and will not die of boredom, because your work is not yet complete. One of the first things that you need to do when you arrive in the Philippines is to get your Visa in order. This mostly applies to those of you who obtained a 13 Series Resident Visa. Even if you applied for and received your visa while you were still in your home country, there are a few things you need to do here in the Philippines to finalize everything. First, you should go to the Bureau of Immigration and they will give you all of the information on everything that you must do. You will need to visit the Bureau of Quarantine to have your X Rays checked and your Medical Clearance. You will also need to process the paperwork for your ACR I-card. Other tasks will be completed at the Bureau of Immigration. Better go to a photographer (usually can be found in the malls) to get some 1×1 and 2×2 ID photos, because you will be needing a lot of them! You should be able to complete the visa finalization in a day or two. If you entered the Philippines on a Tourist Visa or Balikbayan Visa, you should have no further things to accomplish immediately. For tourist visa holders, you will need to go and extend your visa within the first 30 days after your arrival. Balikbayan Visa holders have one year before they have any procedures to take care of. If you did not already get your resident visa, maybe now is the time If you did not apply for a Resident Visa in your home country, and you wish to obtain a permanent resident visa, now would be a good time to apply. To get such a visa, one of the requirements is that you must be married to a Philippine Citizen, or to a former Philippine Citizen. If you meet this requirement, then you should be eligible to receive a resident visa. You should go to the Bureau of Immigration and apply for it! All foreigners who are staying in the Philippines for longer than 59 days, except those on a Balikbayan Visa or an SRRV Visa, are required to have an ACR I- Card. The ACR I-Card is an ID card which is issued by the Bureau of Immigration. If you are here with a Permanent Resident Visa, then applying for an ACR I-Card is part of the process of finalizing your visa when you arrive here. If you have a tourist visa, you will be required to file for an I-Card when you file for your second visa extension, which is due when you have been here for 59 days. The cost of the ACR I-Card is approximately US$50. One thing that I have noticed, and also talked about in depth with other expats is that most newcomers to the Philippines spend a ton of money! I think that it is part of the learning process when you move here. At first, you look at it that money is a cure for any problem, and you spend the money as much as you need (or think you need) in order to solve all of the problems or challenges facing you. With time, though, you will learn how to handle things without throwing money at it. Many newcomers get very agitated about this and feel that the spending of money is out of their control, almost as if somebody else is forcing them to spend money. That is not the case. If your wife’s extended family is demanding money, there is no reason why you must honor the demands that they are making. If you go to the Bureau of Immigration to get some business done there, and people outside are offering to take care of it for you for a fee, nobody is twisting your arm, you can do it yourself. What it comes down to is that you need to realize that you are in control of your money. Only you can decide who gets your money and who does not. Try to control your spending when you first arrive. You will later be happy that you did. It may be a bit hard to learn all of the things that seem daunting, but you must learn over time, so you might as well start now. After resting for a few days, you need to start looking for where you will live. This is important for a number of reasons. Firstly, you need a place to live! Living in hotels, even relatively inexpensive hotels is an expensive way to live! Also, you need to be ready to start receiving the goods that you shipped to the Philippines. Finding a good place to rent will give you the ability to get your life started again, and up and running. How do you find a good place to rent? Well, the Philippines is not like the USA or other developed countries. Even though this will sound a bit different, I can assure you that the best way to find a rental in the Philippines is by word of mouth (asking around), or by just driving around and looking for “For Rent” signs. You will see the signs on the gate at most houses, or on the fence. Generally, looking on the Internet is not a good way to find a rental. Prices are really inflated for properties that you will find on the Internet. Looking in the newspaper is also not a very good way since few properties are advertised in the newspaper. Drive around, look at houses and find those signs! Spread the word that you are looking for a place. Here is another caution. If you are a foreigner, it is not a good idea for you to go to view the house for the first viewing. Let your wife or a Filipino friend go look at it and determine if it is a possibility for you. Let the “looker” get a quote on the price before you go look because otherwise, the price of the house will skyrocket when it is determined that a foreigner is a potential renter. After the price has been established, you can go have a look, and hold them to the quoted price. Generally, Filipinos will want 2 or 3 months deposit and the first month’s rent. It is customary to sign a one year lease. If you want a shorter lease, you should discuss this with the landlord to determine if it will be possible. Get to know the area. Spend some time touring around the town where you have chosen to live. Learn where things are. Start out with malls. Malls are a major part of Philippine life, and you will need to familiarize yourself with the malls in your area. It is not like the USA where you don’t need to go to the malls. Here, even if you want to buy groceries it will likely be done at the mall. Take a taxi and ask the driver to just tour you around town, or ask a friend if he or she can do that. Want to really learn the town, ride the jeepney around and learn how that works, and where the routes are! You can’t really become a Philippine expert until you know how to ride the jeepney! When you go out to restaurants, coffee shops or wherever you choose to go, don’t be shy! Filipinos are a bit shy, but when you approach them or talk to them, they get over the shyness quickly and will be happy to assist you if you have a question, or need some kind of help. So, don’t be shy to approach Filipinos for help. You won’t be sorry, and you will soon develop a network of friends in your area. If you wish to become involved in the community, look for some civic organizations where you can get involved in the community. It will help keep you busy with things to do, and also help you make some friends in your new home. If you are a foreigner staying in the Philippines for the long term, you must go make an annual report at the Bureau of Immigration. This is required to be done every year during the months of January or February. You will be required to pay a “head tax” of P310 for the privilege of living in the Philippines. Be sure not to miss this, as it is required by law. If you think you need a car to get around, you might start shopping for one. Keep in mind that driving rules and practices are a bit different in the Philippines than they were “back home,” most likely. Don’t get angry that they don’t follow the driving rules that you are accustomed to, remember that it is you who must adjust the rules in your new home. Alternatively, consider the possibility of using taxis or jeepneys for your transportation around town. If you want to take a longer out of town trip, you might consider the bus. The Philippines has some very nice buses, some even offer things like WiFi Internet access, restrooms, movies on the bus, etc. Do you have kids? What about education? If you have children that moved to the Philippines with you, you will need to start checking into educational opportunities in the Philippines. There are Private and Public schools to consider, you need to visit those and determine what type of school would be best for your child. If you get to the point where you are a bit homesick and miss discussion from similarly minded people, perhaps you need to get together with a group of other foreign expats in the Philippines. You can often find such groups at places like McDonald’s, at coffee shops and other such places. Most expats are happy to have you join their group for some good discussion. What will you do for entertainment? There are lots of opportunities for entertainment in the Philippines. Whatever you think you would like to do, it is probably available in the Philippines. You will find first-run movies in theaters, usually found in the shopping malls in the Philippines. Maybe you might want to go out to a restaurant, and you might even find some food from back home! Browse the local TV stations, you will find channels with shows that you know from back home. You will surely be surprised at some of the questions that you will get from Filipinos. If you are overweight, they will tell you to your face that you are fat! They don’t mean harm, but on some subjects, they are very direct. I have had women approach me and tell me that they would like to have a baby with me. That is direct, I’d say! Just try to take it in stride and roll with the flow. Just laugh, and they will laugh with you. After you have been in the Philippines for a while and have started to settle in and feel at home, maybe it’s time to expand your horizons a bit? Time to learn the language? One of the best things you can do, in my opinion, is to start learning the language. I can tell you that learning the local language was the number one thing I did to improve my life in the Philippines and make it more enjoyable. I found that it was much easier than I expected because being immersed in the language makes it pretty natural to learn if you are open to it. Find a good language teacher and get started! You will be surprised how fun it is, and also how rewarding it is. Need More Information about the Move? 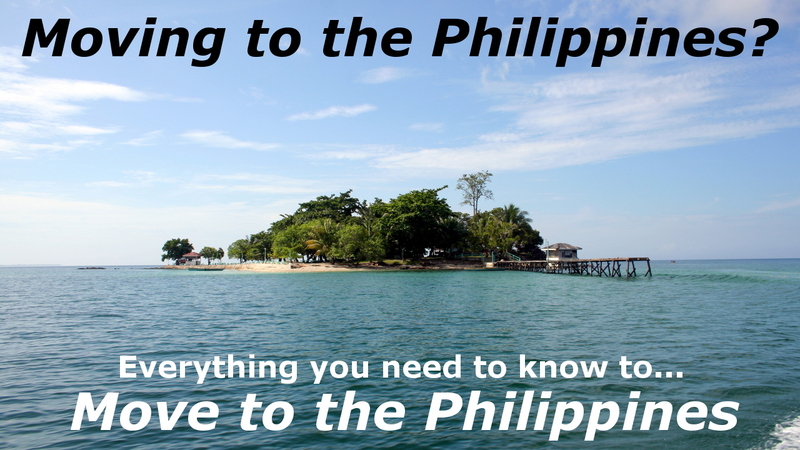 If you need more information about moving to the Philippines, we have just what you need! My book “How to Move to the Philippines Manual” will tell you everything you need to know! It is all covered in the book! Just click on the picture of the book above and you can have the electronic version of the book in minutes! As I said at the beginning of this (long) article, moving to the Philippines is a big thing. Any International Move is something not to be taken lightly. I believe this article is a good guide to help you through the process. We do offer more information custom tailored to your needs through our Coaching Services. 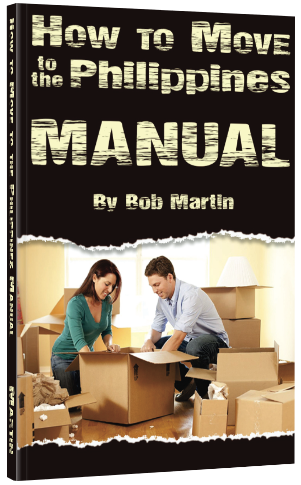 Detailed information can also be obtained through our book, How to Move to the Philippines Manual. You know the ole saying, "People don't plan to fail…they fail to plan." Good article Bob. Thank-you! Good article Bob, personally if I decide to retire there I will not be working, income will be from interest on savings + (early taken) pensions. I have no kids and would live wherever I feel at home. Have had enough hassle with business in the UK never mind trying it in the Phils… I've read too many negative reports about this subject.